Instead, a different monarch ended up buying the necklace: King Ferdinand of Romania. He purchased the necklace in 1921 on an installment plan, paying around 1,375,000 francs in total. (And remember, that's at a 1920s rate.) Ferdinand was married to the glamorous and dramatic Queen Marie, daughter of Prince Alfred, Duke of Saxe-Coburg and Gotha (a son of Queen Victoria and Prince Albert) and his Romanov wife, Grand Duchess Maria Alexandrovna of Russia. Marie had lost many of her jewels in Russia during the war, and she and Ferdinand were on a mission to replenish her jewelry box. Ferdinand had succeeded to the Romanian throne in 1914, but his reign had been quickly disrupted by World War I. In 1922, the year after he bought the sapphire, he and Marie were finally crowned. For the October coronation, Marie wore the diamond sautoir with the enormous sapphire pendant. Two years later, she paired the necklace with a diamond and sapphire tiara that she had purchased from one of her Romanov relatives, the famous Grand Duchess Vladimir, for a portrait sitting with Philip de Laszlo. 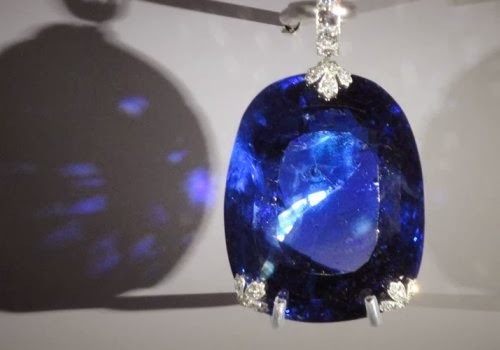 The royal story of the sapphire pendant could have ended there -- but it didn't. Vincent Meylan writes in The Queen's Jewels that Harry Winston sold the sapphire pendant to a wealthy Greek citizen, who in turn presented it to his nation's queen consort: Friederike, the wife of King Paul. Friederike suspended the sapphire from a pearl and diamond necklace. You can see a glimpse of the sapphire on Friederike in the photograph above, taken at a banquet at Claridge's in London in 1963. Friederike took the sapphire with her during her 1964 trip to New York. She also wore the piece that September during the wedding festivities for her only son, King Constantine II, and Princess Anne-Marie of Denmark. She also wore the sapphire at the wedding of Prince Michael of Greece in 1965. But then, the whereabouts of the sapphire become a bit murky. The Greek monarchy was abolished for good in the 1970s, and the family went into exile. Queen Friederike ended up in Spain, where her daughter, Sofia, was queen, while the king and his family relocated to England. The sapphire popped again in public in November 2003, when it was put up for auction at Christie's in Geneva. In the auction notes, the lot was offered for sale by "a noble family." Photo used with the kind permission of thoughtful reader Nancy, who visited the Cartier exhibition. She retains the copyright; do not reproduce. Queen Marie and Queen Friederike's sapphire pendant was the largest sapphire ever offered at auction when it was sold. 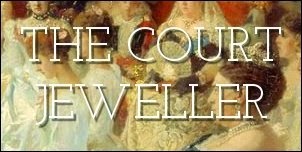 When the gavel fell, the jewel had fetched more than $1.4 million. It's owned privately today, but last year, the sapphire went on display as a part of the Cartier: Style and History exhibition in Paris. Nearly a hundred years after it sparkled in Spain at Cartier's autumn show, the sapphire pendant dazzled public viewers all over again.